I always get asked how to track specific workouts in My Fitness Pal using my Fitbit, so I thought I’d write a how-to so everyone can benefit (and so I can stop retyping it over and over, lol). Please note that your Fitbit tracks all of your activity and adjusts in My Fitness Pal regardless of if you track your workoutslike this, but this process just allows you to pinpoint what you are burning, record, and track your progress on another level. You are not missing out on your Fitbit tracking any calories burned if you don’t record your workouts as I’m instructing below. It will walk you through syncing the two. On your Fitbit, you are going to be working with the activity timer. Start your workout by pressing and holding the button on your Fitbit. Note what time you do this (more on that later). The timer will start, displaying seconds, minutes and hours. Press the button multiple times until you get to the calorie burning display. You will know the timer is running properly if the flame icon is blinking. If it’s not, restart these steps. When you press the button on your Fitbit during your workout, the display will show you the calories burned from the time you started the timer. At the end of your workout, you want to press the button once and note the calories burned during your workout (I only let the timer run for a few seconds so I have a 0 calorie burn here). Press and hold the button to stop the activity timer. 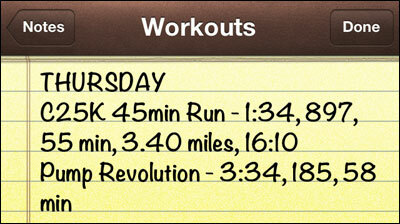 Note the duration of your workout (you can see I let the timer run for 22.9 seconds in this example). I use the Notes app on my iPhone to record the items I told you to pay attention to above. So for my C25K run yesterday, I started my timer at 1:34, I burned 897 calories, and the duration of my workout was 55 minutes (if it’s under 30 seconds I round down, if it’s over I round up). And then I started Les Mills Pump Revolution at 3:34, burned 185 calories, and my workout lasted 58 minutes. 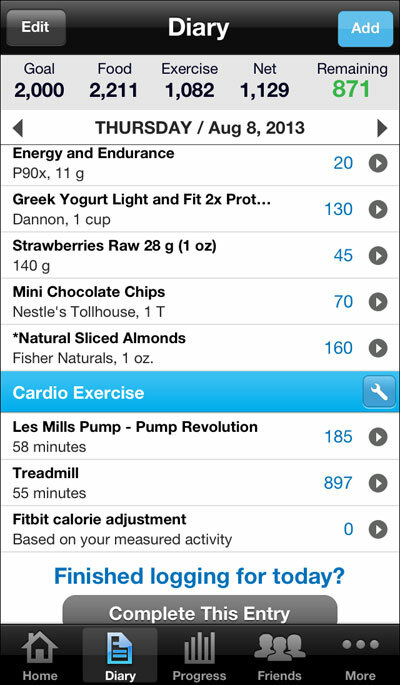 For these steps, I’m going to be showing how to record using the My Fitness Pal mobile app. If you’re logging on the My Fitness Pal website, the steps will be (generally) the same and you should be able to figure it out. Go to the “Add Entry” option and click “Cardiovascular.” All workouts tracked with your Fitbit will be recorded this way no matter what your workout consisted of. 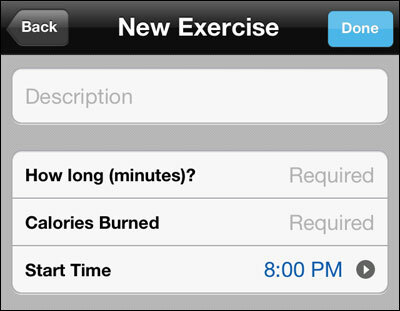 Scroll down to the bottom and click the “Create a New Exercise” button. You can see here that I don’t use any of My Fitness Pal’s default workouts because I just don’t trust that they’re accurate. 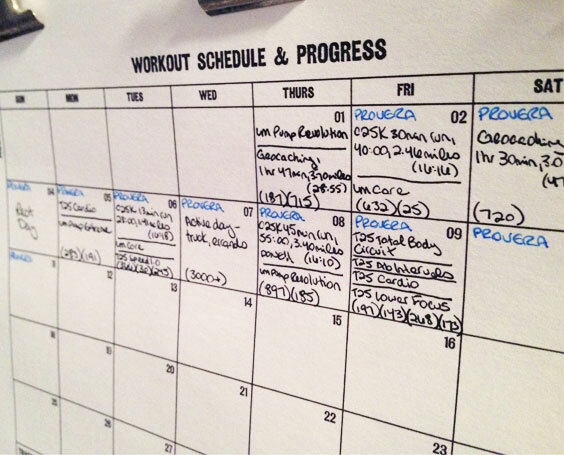 I track all of my traditional program workouts (which I name with the “Program – Workout” naming system) as well as other activities that I know will burn calories and I’ll want to record as a workout, such as busy errand running and manually unloading our delivery truck. 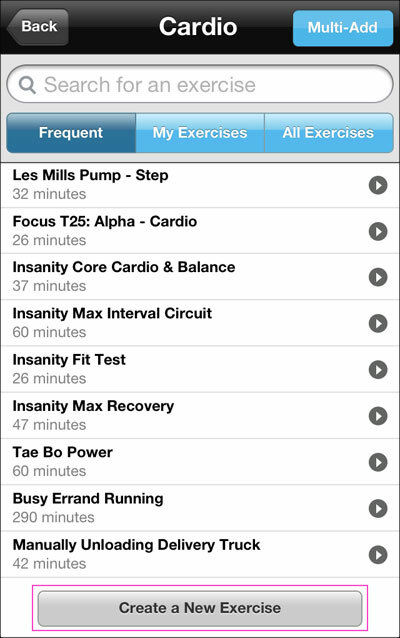 Once you have a workout created, you will be able to search “Frequent” or “My Exercises” and insert the information for that workout so you will only have to do this next step once per individual workout – very convenient and super easy to use once you get everything in the first time. 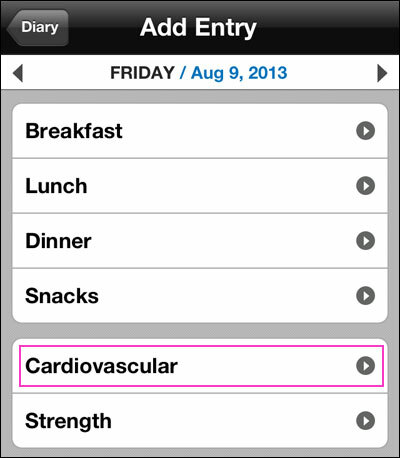 On this screen, you will name your workout and enter in the information you recorded during your workout. You will see all of your manually entered workouts at the bottom of your My Fitness Pal Diary screen along with your Fitbit Calorie Adjustment (and I’m not sure why mine was 0 yesterday, I normally have a number there…I don’t question the Fitbit gods and we get along just fine). 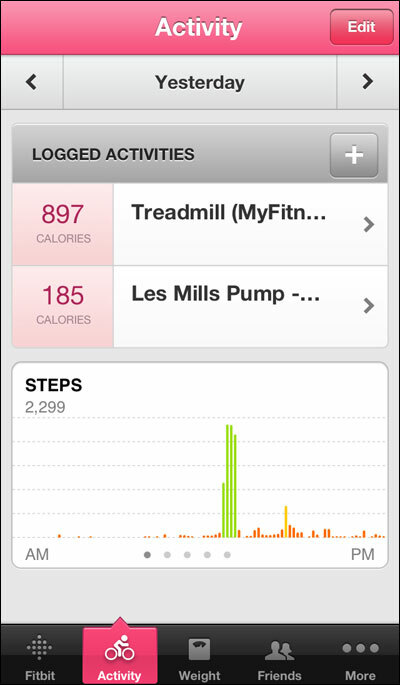 If you go into your Fitbit mobile app or on the Fibit website, you will also see your workouts labeled on your Activity tab under Logged Activities. 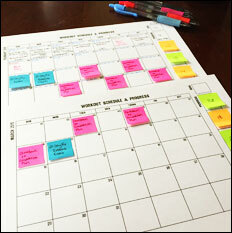 I go a step further and record my workouts on my monthly progress calendars, which you can download for free. I track my calories and workouts carefully, and I really love to record my progress and look back over the months and years to see my progress and to pinpoint issues if I find that I’m gaining or not meeting my goals. Documentation = Success in my book, and the more I have to work with, the better. Set your goals, track your progress! 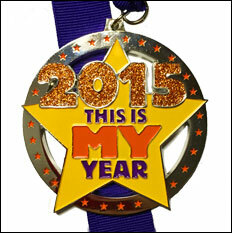 Join our virtual runs - multiple medals available! CORE DE FORCE Challenge Group Starts November 28th! 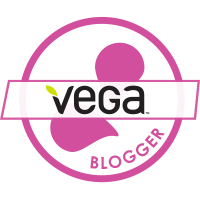 Nektar Naturals: Honey Without the Sticky Mess! Bulu Box: Monthly Samples Delivered to Your Door! It’s Time To Get Freekeh! 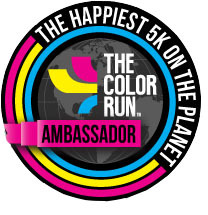 The Color Run SHINE Tour is Coming to Cleveland! Nuun Hydration: Water Has Never Tasted This Good! Les Mills Pump & Les Mills Combat Sale! Fitbit Charge and Charge HR On The Way! Guess the Gender and Win!